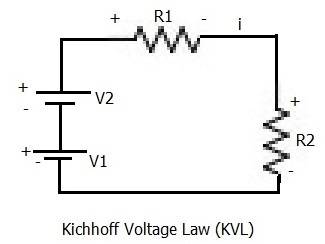 This page on KCL vs KVL mentions basic difference between Kirchhoff's current law (KCL) and Kirchhoff's voltage law (KVL). There are two Kirchhoff laws namely KCL and KVL as mentioned. KCL deals with flow of current while KVL deals with voltage drop in closed network. The KCL states that "algebraic sum of currents at any node of a circuit is zero". In other words, algebraic sum of currents entering a node must be equal to algebraic sum of currents leaving a node.